I have many dogwood memories. I grew up in the mountains of Tennessee where the spring is beautiful with azaleas, rhododendron, redbuds and dogwoods. There is nothing quite like seeing the mountains dappled with red, pink, purple and white! When I was a teenager my dad came home with 8 dogwood trees he had dug in the woods where he had lived as a child. He was so excited about these little samplings. I wasn’t sure. They didn’t look too impressive. I was not sure they would live up to the impressive ones I had seen in the mountains. But, over time I became very impressed! To this day those dogwood trees line my dad’s driveway and are spectacular in the spring. These dogwood trees have brought my family years of pleasure and have brought food and shelter to the many birds there! When Greg and I moved to our home 26 years ago, we couldn’t wait to plant dogwood trees and through the years we keep adding more. Currently we have 3 very large white dogwood trees, 1 medium sized white and 3 small pink dogwood trees! Funny story… when we bought the last 3, I told the nursery I only wanted white dogwoods. They were not blooming at the time but the tag said, “white.” All of them bloomed pink! And, the nursery went out of business the next year–so pink it is! They are beautiful too but white are still my favorites. I hope you have a glorious GOOD FRIDAY. Teresa I have always loved dogwood trees. I did not know about the Cross and the legend of the dogwood. Thank you for sharing! I’m always interested in Bible stories about plants and trees. Good morning Susan! I was looking at my dogwood blooms yesterday and thinking of the legend. Right now my dogwoods trees are spectacular and yesterday when I talked to my dad his said his were spectacular too. 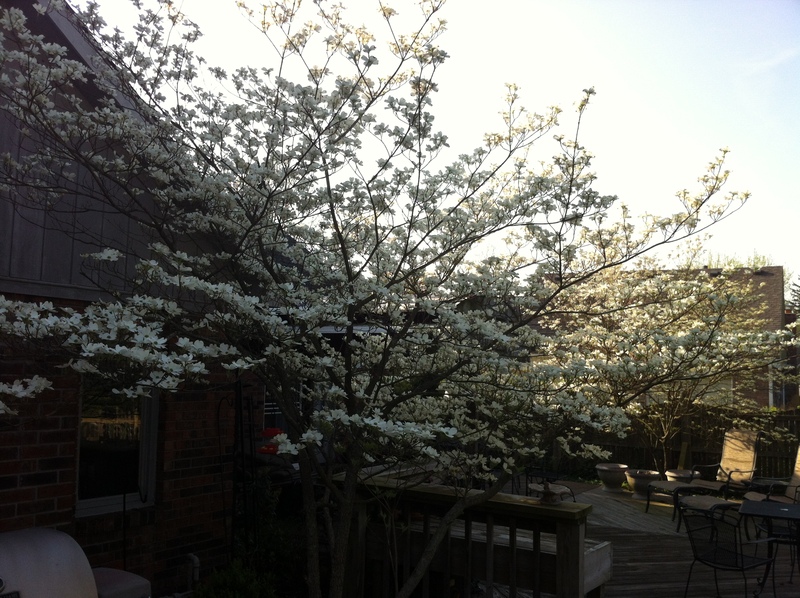 My dogwoods usually bloom 3 weeks AFTER his… we are sure having an early spring! I always love to see the dogwoods bloom. My mother knew this legend by heart and relayed it to me each year at this time when I was growing up. It is a story I’ve never forgotten. Chris, Your mom was such a special lady! She knew her roses and her dogwoods. I am looking at my dogwoods this morning and they are spectacular. My dad told me last night that his are too! Just took a stroll through your garden and the Dogwoods are truly breathtaking. I was wondering if there were any helpful tips you might have about growing them and I was wondering what the shrubs were that you have growing underneath ( around them). Harison caught my eye again. I don’t think I’ll be able to resist any longer! Thanks again for inspiring creativity in the garden. Betty, Dogwoods do best when they have protection from the elements. In nature they grow under the canopy. Our fences, large shade trees and house surround them. An excellent pairing is to plant Rhododendrons under them. I have Rhododendrons, Hostas, Ferns and Boxwoods planted under and near and we mulch heavily! I have to say the summer drought was very hard on them. Hoping all will be well in the spring!!! I am seeing berries and that is a good sign.